It looks like ZTE’s kowtowing to US regulatory authorities is paying dividends, as it has been granted permission to conduct some limited business activities there. Having thrown everything at the problem, including the complete replacement of its board of directors, ZTE still faced the prospect of remaining in the dog house thanks to the US Senate’s resistance to President Trump’s ad hoc deal making efforts. But the US Bureau of Industry and Security, which imposed the lethal export ban in the first place, seems to have found it in it in its heart to offer some minor concessions. In a statement dated 2 July, BIS said it had received a number of requests for authorization to let ZTE engage in conduct otherwise prohibited by the export ban order. While not explicitly stated it seems safe to assume that the most significant of requests came from Trump. While it wasn’t sufficiently moved by these pleas to lift the ban entirely, BIS decided to put ZTE on life support for a month. You can see the full wording of what ZTE is allowed to do for a month below, which essentially amounts to a one-month loosening of the sanctions to allow ZTE to maintain its existing business interests but not to commence full trading. 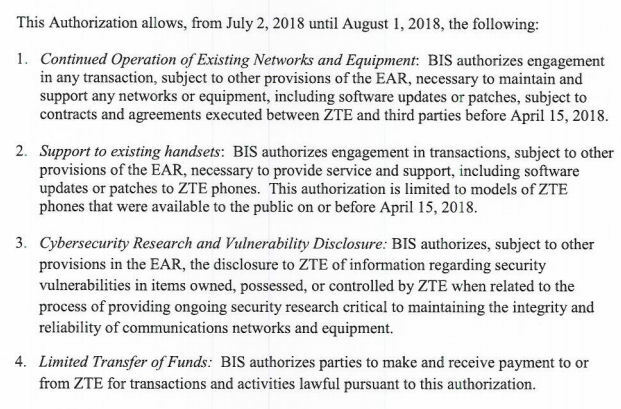 Bloomberg was one of the first places to get a look at this document and seems to think it’s designed to reduce the amount of damage done to ZTE while it continues to strive to get the ban lifted. The position now seems to be that once it belatedly does everything BIS wanted it to do there’s still the possibility of a reprieve, but it’s not clear what the US Senate position is on that. If you rescind a punishment in the face of contrition it does undermine the whole concept somewhat. And as we’ve said all along, even if the whole of ZTE’s punishment is reversed, a lot of the damage has already been done. Bloomberg again has the scoop that ZTE has lost a €600 million deal to provide base stations for Wind Tre in Italy thanks to the ban. The beneficiary in this case is said to be Ericsson, but it seems safe to assume that all ZTE’s competitors are stealing business from it for the same reason. Having said that it looks like Huawei continues to suffer collateral damage from the whole affair, even though it’s not currently accused of the same level of naughtiness. Towards the end of the Bloomberg video report below we hear that some US law-makers are feeling nervous about the Sprint/T-Mobile US merger because of suspected ties between Sprint owner Softbank and Huawei. However all this resolves itself the mistrust between the US and China seems likely to remain at a historical high.